Editor’s Note: We invite you enjoy this special, sneak peek preview of our March, 2010: Games, Gadgets, and Gizmos issue; this interview special will be re-published in the March issue, along with a host of other extras and goodies on Bill Gates and Technology, so keep your eyes peeled for the March edition! There are few people in the world that wake up in the morning and turn on a computer, go to school, or even walk to a well to pump fresh water in a poverty stricken community that do not owe partial gratitude to a man who is a thinker, engineer, and pioneer in the technological world; this man also happens to be a major philanthropist that uses his multi-billion dollar enterprise to better the world around him. Most people know him as one of the world’s wealthiest men, but those who know him best just call him Bill Gates. And with the techie world advancing around us at an alarmingly fascinating speed, we’ve had the privilege to come to the heart of it all by interviewing one of the greatest explorers and inventors of the last millennium. Read on to step into the future of technology and into the mind of Bill Gates, and be prepared to get inspired! Special thanks to Bill Gates for taking the time to share his thoughts, technological insight and vision for the future of education and children everywhere. We are grateful for the opportunity to share this exclusive Amazing Kids! 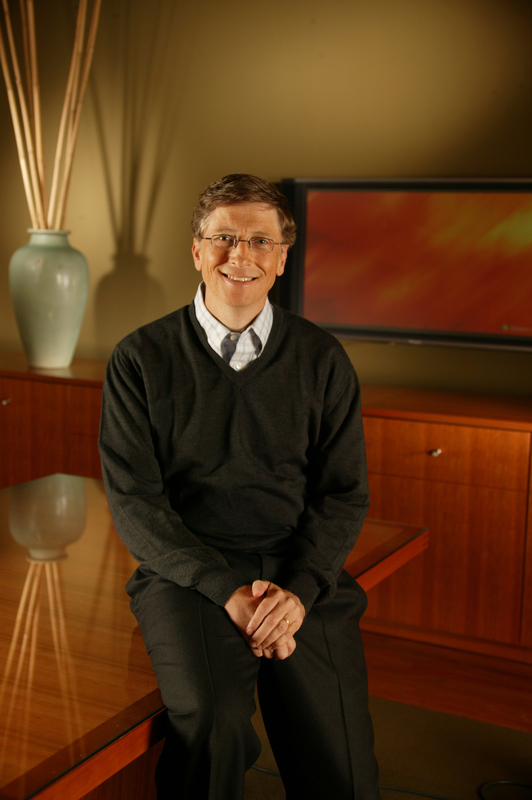 interview with Bill Gates with our readers. AK: How does technology impact lives of people around the world, and in what ways will this impact change as technology progresses? BG: Technology can improve people’s lives in two ways. First, it helps us do things more efficiently. This is something technology has always done, starting with the first tools, like hunting implements. By helping us to be more productive, technology lets us to spend less time focusing on survival, and more on solving other challenges. Technology also improves our ability to find and share information. This has been going on for a long time, too-it goes back to the invention of tools for writing, the printing press, the telegraph, and more. But this process has gained incredible speed thanks to computers and the Internet. This is helping us tackle big problems in science, medicine, engineering, and other areas more quickly than ever before. I believe technology will continue to become more affordable and more people will have the chance to use it. This will help more people get medical care and a good education. It will give them information about things like how to grow crops more successfully. All of these things will be important in lifting people out of poverty. I think we’re also close to some important advances in computers that will give scientists new ways to understand the world and work together to make progress in areas like genetic research and energy that will have a big impact on all our lives. AK: How can kids today use technology to follow their dreams and help make their world a better place? BG: In some ways, being a teenager is probably a lot more complicated than it was when I was a kid. But in many ways I also think it must be incredibly exciting to be a young person today. You have access to so much more information than I did when I was a kid. You have truly amazing opportunities to bring new ideas and new technologies together to really make a difference. If your goal is to make the world a better place, one thing you can do is pick a specific challenge that you really care about. Then, learn as much as you can about it and try to volunteer your time to help an organization that is working in this area. While you’re doing that, look for creative new ways to use technology to tackle parts of the problem that you come in contact with. AK: Did you have mentor(s) as a child? If so, in what ways did they impact you positively as a person and how did they help you launch your dreams? BG: So many people encouraged my curiosity and supported my interests when I was young. So it’s hard to point to just one or two and say they were my main mentors. But I think my mother had a special influence because she believed so strongly in helping others and she passed this belief on to me. My Dad always encouraged me to get involved in things I was passionate about. Another person who played a really important role was my friend Paul Allen. He was three years older than me when we met in junior high school, which is quite a bit when you’re that age. We spent a lot of time together back then trying to figure out what computers could do. He was the one who first recognized that computer chips would quickly make computers cheap enough for almost everyone to use. That’s what led to the beginning of the PC revolution. He was my partner when we started Microsoft. AK: What advice would you give to a kid who wants to explore technology, but doesn’t quite know where to start? BG: Read a lot. Magazines like Scientific American or the science section of newspapers, like the New York Times, will give you have a good sense of how science and technology are changing. There are some great websites, too, like Popular Science (www.popsci.com) or the Tech Museum (www.thetech.org). Take a computer programming class so you can learn how computers work. Sign up for the Microsoft Imagine Cup or one of the robotics contests for high school kids that take place around the country. These are a lot of fun and they are a great way to have a fantastic hands-on experience with technology. AK: How is the Bill and Melinda Gates Foundation helping kids of diverse backgrounds from around the world? BG: The Bill and Melinda Gates Foundation is working to reduce poverty and improve health for kids around the world. We’re trying to find news way to treat diseases like malaria and tuberculosis that affect millions of poor children. We’re working to provide better care for mothers and children, and to make sure more kids get vaccines for preventable diseases. We have programs to help poor farmers improve their harvests so their families have enough food to eat. In the United States, we’re working hard to support efforts to make sure high school students graduate and have the skills to be successful in college. We also offer scholarships for many kids who can’t afford to attend college or graduate school. AK: If you could see one dream for the world’s kids and teens fulfilled in your lifetime, what would it be? BG: My dream is that every child has enough food to eat, good medical care, and the chance to go to school and even attend college. I hope someday what people can do with their lives depends on their talents and how hard they are willing to work, rather than on where they happen to be born.